Store owner relieved after alleged armed robbers caught - KUAM.com-KUAM News: On Air. Online. On Demand. Two men believed to have been involved in a pair of armed robberies caught on camera are captured. Investigators were quick to solve this case which began last Friday. The video we brought you over the weekend showed a rather scary scene inside a local store in Dededo. Today, the store owner is relieved the suspects have been taken off the streets. "The guy is a regular customer here so I am just glad they caught the guys," Justin Cabrera, an owner of Loco Mart store said. Surveillance video at the store captured it all unfolding last Friday night. The suspect covered his head and concealed his face with some kind of cloth, only revealing his eyes. He also wore an open front cardigan and used blue gloves to hold up what appeared to be a shotgun. "When the guy came in with the gun, you won't see it in the video but he gave my cashier his own plastic bag," Cabrera said. "He basically was hustling my cashier to get in there, but I believe that it was probably about timing because usually it's dead and we are just about to close." The suspect took off with more than $1,500 cash. "We've been robbed many times just never an armed robbery," Cabrera said. "I didn't think it would happen but we are thinking to put more personnel especially at night." The video of the robbery circulated on social media over the weekend. Cabrera's store wasn't the only shop hit that night. Police said about an hour before the Loco Mart robbery, officers responded to a similar call at the Papa John's Pizza restaurant in Mangilao. Both cases are apparently connected. The video was enough for investigators to look up the suspect's getaway car before making the arrest. "Social media just helps you catch the people fast," Cabrera said. 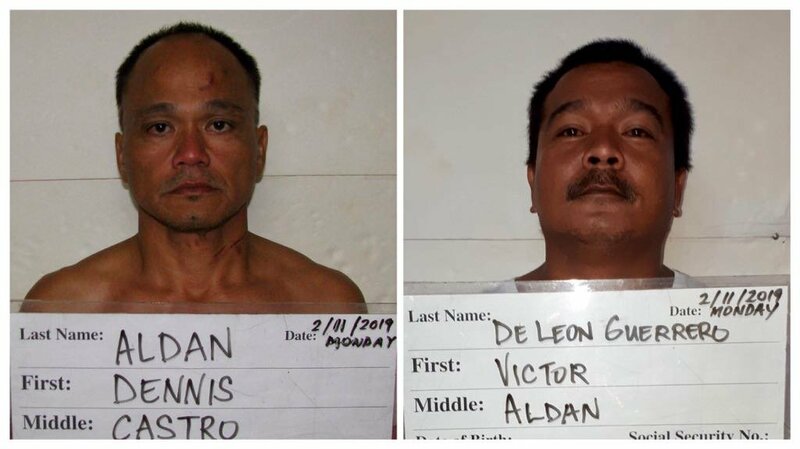 Dennis Castro Aldan and Victor Aldan De Leon Guerrero appeared in court today in connection with the robberies. The pair is charged with two counts of second degree robbery and theft with a special allegation of use of a deadly weapon during a felony, along with two counts of conspiracy to commit second degree robbery and theft. Court documents state De Leon Guerrero denied any involvement in the robberies and told police he allowed Aldan to borrow his car for a few hours that night. He also told police he believed the weapon Aldan was allegedly using was a pellet gun that inside the car. Authorities tracked down Aldan who then told police he allegedly planned the robberies with De Leon Guerrero. Both alleged robbers had prior run-ins with the law. Prison records show that Aldan has about 20 previous cases that go as far back as 2006 ranging from terrorizing, theft, criminal sexual conduct, and assault. De Leon Guerrero has a handful of previous arrests dating back to 2001 that include theft of property, burglary crimes against tourist, drug possession, and child abuse.